Which one is the best fit for you? The Charge line is Fitbit's best-selling brand of fitness trackers. The Apple Watch Series 4 is, well, an Apple Watch. Both of them are two of the more popular wearables you can slap on your wrist. The Apple Watch is a full-on smartwatch, with an app store and a number of big features. Apple has gone big on health, too, with a built-in electrocardiogram and fall detections. The Charge 3 is Fitbit beefing up its fitness tracker, adding an SpO2 sensor that could, eventually, help you detect sleep apnea and atrial fibrillation. But, which wearable is the best for your wrist? Or, which one should you pick up for your nearest and dearest this holiday season? Let's put them to the test. The Apple Watch and Fitbit Charge could not look more different. The Apple Watch, of course, is a smartwatch. It's got a square-ish look with an edge-to-edge display that comes in two watch sizes: 40mm and 44mm. You've got that beautiful AMOLED display on top that makes it a breeze to use. You also have the Digital Crown off to the side next to the, well, side button. On the back, you not only have an improved heart rate sensor but a built-in ECG reader. The Charge 3, on the other hand, is a fitness tracker. Fitbit has made it comfortable to wear, but it's not breaking the mold in fitness tracker design. It does have a good touchscreen display, though one that's much smaller than the Apple Watch. Both companies have done a good job of allowing you to customize your wearable. Fitbit has learned a lot from Apple and the success of the Versa, and it offers a variety of bands to let you change up the Charge 3's design. The options aren't as wide ranging as the Apple Watch though, which has essentially created a cottage industry of third-party bands. No other band has a proprietary band market as big or as diverse - sorry Fitbit. If design is your chief worry here, then you'll need to decide whether you want a larger, more watch-like design or something slimmer on the wrist. The Charge 3 is hyper focused on fitness, and it certainly shows. Fitbit has crammed as many features as it can into this fitness tracker. There's even room to grow thanks to that SpO2 sensor, which Fitbit promises will eventually be able to track atrial fibrillation and sleep apnea. The Apple Watch and Charge 3 do have some stuff in common. Both devices are waterproof, so you can take them for a swim. They both also have a number of different modes for workouts, like swimming or cycling, and they'll both track your breathing to help you gain some much needed mindfulness. Both wearables have automatic workout detection too, though they work a little differently. The Charge 3 can detect what workout you're doing and automatically start doing it. The Apple Watch will wait until you've been doing the activity for a while, and then it will give you an alert to ask if you're doing the workout it believes you're doing. Where things start diverting heavily is when it comes to heart rate and health monitoring. The Apple Watch can send you alerts about your heart rate and tell you if its too low or too high, which can be a sign of atrial fibrillation. You can also use the built-in ECG reader to get a ECG reading of your heart - better yet, it's also FDA certified. The Charge 3 can't do either of these, though its SpO2 does promise some future features. Atrial fibrillation and sleep apnea are the two big ones here, though the Apple Watch is close to detecting atrial fibrillation. The Apple Watch's advantages also include fall detection, which will send out an alert to emergency services if you fall and don't get up. All of the Apple Watch's abilities mean that the watch has the potential of saving your life. This cannot be said about the Charge 3, which has the tools to help you keep track of your fitness, but not save your life in the same way the Apple Watch could. Oh yes, one of the biggest differences between the Apple Watch and Charge 3 is sleep tracking. The Charge 3 can track your sleep, and Fitbit's also got Sleep Score on the way, which can score your sleep and let you know if there are disturbances in your sleep. The Apple Watch just can't do that, largely because it doesn't have the battery life the Charge 3 does - though we'll get to that later. As for heart rate, we found the Apple Watch a little better at the higher intensities, but Fitbit's improvements are plain to see, and the Charge 3 performs better here than the Charge 2 did. Still, the Apple Watch is leading in wrist-based optical accuracy. The Apple Watch is probably the standard bearer for what a smartwatch should do. It's got NFC for contactless payments, it's got an app store, it's got the ability to use cellular data to become a standalone device, and it's one of the best smartwatches for delivering notifications. The Charge 3, on the other hand, is a wearable that's blurring the line between smartwatch and fitness tracker. It's got notifications and a large enough display to actually make them useful. Like the Apple Watch, you can reply to message notifications with quick replies - but only if you have an Android phone. The Charge 3 also has NFC for contactless payments - in this case Fitbit Pay - but that's only if you pony up a little extra for the special edition. The Charge 3 also has apps, but there's no app store here like there is on the Versa or Ionic, only select partnerships that Fitbit has struck up. Don't forget the Charge 3 doesn't have cellular, which means it needs your phone to keep connection - this goes for GPS too, which is available on the Apple Watch but not on the Fitbit. Fitbit has overhauled the UI and underlying system on the Charge 3, and brought its popular Today Dashboard to the tracker. It's also got a number of faces that you can use to take a look at your fitness statistics and keep track of the day. However, being a smartwatch with a color display, the Apple Watch naturally has a better selection - and Apple has done a good job of making faces for different purposes. For example, there's the Siri Watch face for some assistant action, while the Modular and Infograph watch faces surface a lot of information at once. Plus, you can plug in third-party apps for some cool complications. We do wish Apple would open up the possibility of third-party watch faces though. Bonus: Yes, the Apple Watch has a digital assistant, which Fitbit doesn't. The Apple Watch is a smartwatch and the Charge 3 is a fitness tracker. As expected, you're going to get a more fully featured set on the Series 4 than you are on the Charge 3. The Apple Watch is still a smartwatch that you charge up every night before you go to bed. Sure, you can stretch it to a second day if you like, but it's still a wearable that you have to charge ever night - even Apple admits this. This also means the Apple Watch can't do things the Charge 3 does, like sleep tracking. The Charge 3, on the other hand, will get you seven days of battery life on a single charge. Part of this is because the Charge 3 doesn't feature GPS, and instead relies on Connected GPS with your phone, which drains much less battery. The Fitbit Charge 3 is definitely the more affordable option, coming in at $149.95, which is less than half the price of the Apple Watch Series 4. If you want the Charge 3 with Fitbit Pay, you will have to pony up $20 to get it. The Series 4, on the other hand, starts at $399 for the 40mm GPS model and $499 for the 40mm LTE-enabled version. It gets more expensive if you want the 44mm version, or if you want the stainless steel or Hermes models. You can't lose if you choose either of these devices. 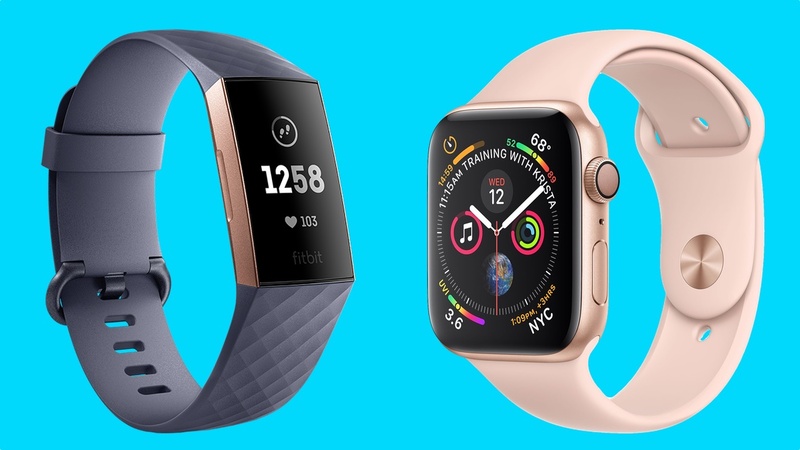 The Apple Watch is a very good smartwatch, maybe the best we've tested, and the Charge 3 is a very good fitness tracker that includes loads of potential for the future. Both are top of their respective games. However, there are fundamental differences here that you need to consider. If you want a wearable that could potentially save your life, the Apple Watch is a better choice. If you want a standalone device, the Apple Watch is a better choice. If you just want an overall look at your fitness and nothing else, the Charge 3 is a better choice - though you should be aware that there are potential reliability issues with heart rate. You can't lose with either of these, but you need to figure out what kind of wearable you want and why - then your choice will be made. I didn't bother reading past the headline because this article never should have been written.